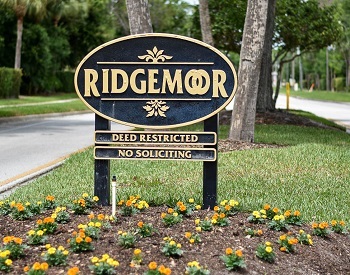 Ridgemoor is one of the largest communities in the East Lake area of Palm Harbor comprised of many different subdivisions with a vast variety of homes, villas, townhomes, and condos. Ridgemoor offers an abundance of unique real estate properties with your choice of styles and sizes. Located off East Lake Road, Ridgemoor homes for sale are sold quickly as it is one of the most sought after neighborhoods in this area. Ridgemoor's basketball and tennis courts, children's playground and nature trails make this a great place for a family to call home. Whether it's a smaller home, a condo, or an executive style luxury home you are looking for, you can find it here from two bedrooms to five bedrooms with prices ranging from the $100Ks to $1M+. Nature preserves and ponds throughout enhance the peace and tranquility found here. Top rated schools in Pinellas County along with a YMCA and library close by add to the attractiveness of Ridgemoor to so many families. It is convenient to plenty of shopping and restaurants galore. Just outside this Florida community, you can enjoy John Chesnut Sr. Park with picnic pavilions and boat access to Tarpon Lake, biking and walking just across the street on the Pinellas Trail, and so much more. Selling your Home in Ridgemoor? Are you thinking about selling your home but dont even know the first steps to begin? We are experienced real estate listing agents in Ridgemoor and have had many succcessful listings and buyer sales. Give us the opportunity to sell your home. Call an agent at Lipply Real Estate who can help you from the beginning to the very end in the process of selling your home. Call us today and see what our marketing plan can do for you!